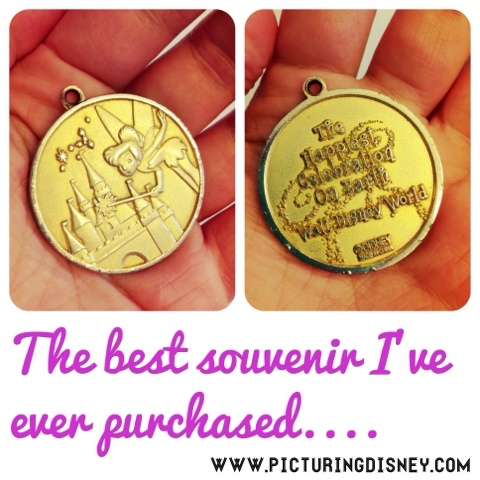 Picturing Disney: Which souvenir do you LOVE most? If you are here you love Disney and they have some of the best merchandise in the stores and parks that any company has produced. Somehow there is magic and fantasy wrapped up in magnets and toys. While I am not overly into the consumerism aspect of the parks some of the souvenirs I have acquired over the years hold special meaning to me. My favorite being a coin keychain that my husband got me on our first trip together and my first trip ever. My first trip was a celebration of my college graduation in January 2006. My husband ad I had been together for 5 years and even though we had been away together before this it was our first vacation just the two of us and the first time I ever flew on an airplane! After getting back from our first full day in the parks we stopped into the gift shop at our hotel (All Star Movies). I found this coin keychain and my husband bought it for me. It's small and nicked up and scarred. The original key ring has broken and since the first time the ring broke off I've replaced it twice. I once lost it in a parking lot at grad school and when I came back out from class I found it right there on the ground. It isn't just a keychain to me anymore. It's part of the memory.